Whether it’s lima beans, broccoli or kale, it’s easy for parents to fixate on their kids eating healthy foods. Of course, fretting over what our children do and do not eat comes from a good place—we want them to grow up healthy and strong. But is it worth the worry, and the frequent mealtime battles? Can relaxing about what your kids consume actually help them have a better relationship to food in the long run? 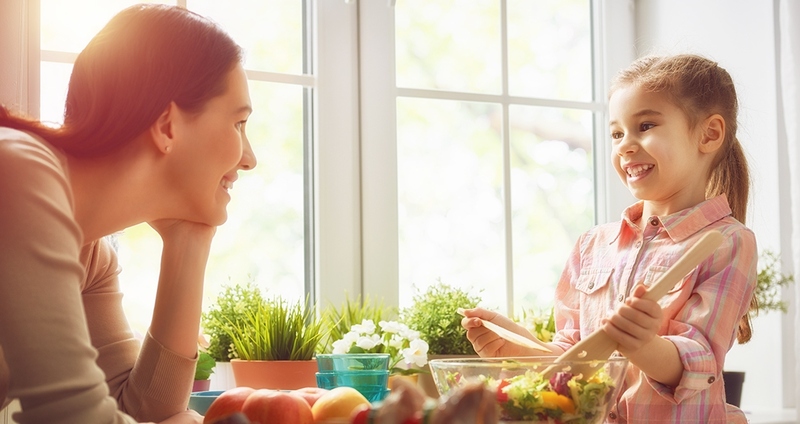 “I encourage my clients to take a wide view when evaluating what their kids are eating,” says Teri Sprouse, a licensed clinical social worker and holistic nutritionist in Portland, Oregon. “Don’t focus on what’s lacking in one individual meal; consider what they’ve eaten over the course of a day or even entire week.” In other words, if your kiddo has had protein, fiber and healthy fats in the last few days, eating only pasta one night for dinner is fine. to food in the long run? It’s also important to remember that no single food is a panacea—even kale. All the nutrients packed in the popular leafy green can be found in a variety of foods, such as beans, lentils, fruits and other vegetables. The body pulls what it needs from our diet, and as long as your child is eating an array of different foods, chances are he or she is getting everything required to build a healthy physique. And if you want a little extra insurance, a high-quality multivitamin can provide some peace of mind. One way to achieve this dynamic is by serving foods family style, letting kids serve themselves the dishes they want and how much. Be sure to always make at least one thing you know they will eat. Some experts even recommend putting dessert-type options up for grabs too. If kids don’t view sweets as a reward you grant them for eating foods you consider “healthy,” they are less likely to overdo it on sugary treats when you are not around to call the shots. “It’s also important to remember that if you are the one always choosing what your kids eat and how much, you are teaching them to ignore their own physical cues.” Of course for this to work well, children need to understand all the food rules in your house. For example, you might remind them that the kitchen is closed after 7:00 p.m., so if they don’t eat enough at dinner, they may go to bed hungry. Or maybe you decide that if they are hungry again later in the evening, dinner leftovers or fresh fruit are their only options. Figuring out what works for you and your kids might take some trial and error. Perhaps getting more input from them during shopping trips or having them help plan and cook one meal a week will get them more excited about what they’re eating. Overall, allowing kids to make decisions about their nourishment needs now gives them a sense of control that can translate into better food choices even when they are all grown up.